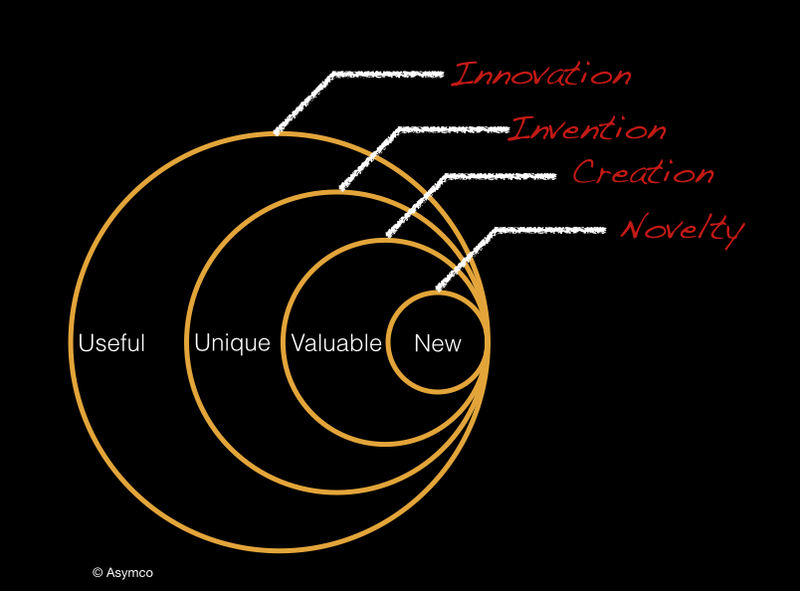 The word “innovation”, and it’s many definitions, has been an ongoing source of frustration. And clearly, I’m not alone in this. I’ve wrestled with this topic regularly in attempts to find / create common language to work with. Trying to establish innovation as a core competency across an organization is really challenging when you can’t even clearly agree on what the word means. And yet, we can agree that innovation remains a crucial component for creating compelling and useful products and services that will shape the future of our organizations. Technology analyst Horace Dediu wrote a compelling essay on the misunderstanding of innovation. In it, he breaks down some definitions of innovation and the activities surrounding it to give the definitions better context. I found this to be very helpful in getting beyond simple definitions and starting to move towards understanding and meaning. Simple, concise, and uniquely useful. Now that’s something we can work with. Everybody wants to be innovative. To be able to crank out great new ideas on demand that win in the marketplace. Of course the catch is that there is no clear path for being able to do that. Or is there? Despite the constant barage of muddy definitions for "innovation" and the constant stream of books, blog posts, and "expert opinions" out there, there are some common themes that show a useful blueprint to follow. We can start simply and get the basics in place without nearly as much drama as seems to be required. What does it boil down to? Get to know your customers. Figure out what needs they have that aren't currently being met. Then work out a list of ideas for how you could meet those needs. Then immediately start building prototypes to get some feedback from the real world. That will help you figure out if you're on the right track. And it will show you which elements need to be tweaked. Then repeat those steps until you've got a solid product. So how is this different from the traditional product development approach that is still so common? The main point is that it is very customer-centric throughout the design process. We're building solutions for them and we need to remember that. Secondly, the iterative loops of building, testing, and tweaking need to be on a small scale. You're trying to test ideas and pieces ahead of building the whole product. Keep a bias for action and keep taking small steps forward as often as you can. Overly simplified? Totally. But still, it's important to remind ourselves that the fundamentals of innovation are pretty straightforward and accessible. Sure, there's plenty of room to go deeper and explore the many specialized tools for innovation. But these are things we can do today, with the resources at hand, so we can start making better solutions for our customers now. One of the core tenants of Human Centered Design is being able to approach design challenges with a "beginner's mind". It's a way of intentionally leaving behind our knowledge, assumptions, and prior experience so that we can see more clearly. Instead of being fixated on what we think we already know, it opens the door to being able to see more deeply and get at the underlying truth. It's a powerful tool. But it's also one that's easy overlook and then slip into old ruts. Even though I should know better, I'm amazed at how quickly I can shift from that powerful outsider's view into one where I've become the insider, unable to see things clearly. I got a fresh reminder on this when a coworker with a fresh perspective helped me get unstuck with some insightful questions. In practice, I think this comes down to two things: 1) We need to be intentional about cultivating this ability in ourselves and 2) having trusted friends to provide a fresh look can be invaluable. To grow this ability in myself, I'm trying to build up better checklists of questions to ask myself as I'm working through the design process. A set of general, but targeted, questions can help make sure I'm not getting tunnel vision. For the days when I really get stuck ... those are the times I'm most thankful for sharp friends and coworkers. How are you keeping a fresh perspective on your work? A colleague forwarded me a TEDx talk by Andreas Ekström about the power Google wields as the keeper of the world's mightiest database. His discussion got me thinking about the data mining we do as part of the front end of innovation. Yes, this whole thing with Google continues to be creepy. And yes, I continue to think Google is in fact Skynet (look it up). Even FastCompany agrees on that point. But seriously, what Google is doing is profound and unprecedented. They are amassing an enormous collection of data while getting better and better at querying that data to learn things. In Ekström's examples, Google is essentially predicting the future by looking at the right leading indicators. Good innovation is built on deep empathy with our users / customers / members and to get there we need both data and insights derived from that data. We're building a growing body of data to query but we need to get better at asking the right questions and doing good analysis to get solid answers to them. Google is spending a lot of time and money quietly practicing at this art form. I'm increasingly convinced we need to get more serious about doing the same and incorporating these skills into our innovation process. How often are you being stretched in your thinking? Are you surrounding yourself with people that inspire you and cheer you on to do your best work? The biggest challenge we face today is in making the choice to do remarkable work. It’s easy to fill a day with busywork. Far more challenging to step up and do the things that scare us. The things that will make a difference. To take a risk on something that may or may not work. For the most part, I’ve got a pretty clear sense of what I need to be doing to accomplish the bigger goals I’m chasing. But in the day to day grind, I find it incredibly hard to keep stepping up and going after it day after day. I’m hoping that some day it becomes more of an automated habit and less of a daily battle. In the meantime, I’m still chipping away at this and any help I can find along the way is appreciated. One of the ways I’ve found help has been in connecting with like minded people who are also pushing themselves out of their comfort zones. Sharing ideas and support can make a big difference in how well we push through the hard work in front of us. I’ve had the privilege of making friends at some events over the past few years that have continued to help push me along. One of the most memorable was Seth Godin’s 2010 Road Trip stop in Minneapolis. I learned a lot from him but also from the people I met while helping organize the event. The event pushed the boundaries of my thinking and the people inspired me to action in the application of that thinking. I’m in the process of traveling to New York to participate Godin’s “Embracing the Possibility” event this week. I’m not entirely sure what to expect … but I know I’ll be stretched in my thinking and pushed towards action. Both are invaluable and well worth the cost and effort of getting there. How are you being challenged (and pushed) today? Admittedly, I'm not much of a gamer. Mostly because I know that dabbling with them in the past turned into a giant timesuck for me. But it is always interesting to see products like Microsoft's new Xbox One launch. Technical specs aside (and from this geek's view, they do look pretty cool), the thing that looks most interesting to me here is the potential business impact it could have for Microsoft. The current Xbox 360 has been on the market for seven and a half years already. An eternity compared to most tech products. But in that time, it's done what other Microsoft products couldn't: Grown in this post-PC world and owned it's space. "At this point, fewer than 2 million Surface tablets have been sold. Windows Phone has a 3.2 percent share of the smartphone market. The Xbox 360, on the other hand, has sold 77 million units and has been the bestselling game console in the US for 28 straight months. Not to take anything away from Microsoft’s other consumer products, but there’s no longer any question which side the company's bread is buttered on. And if the Interactive Entertainment Business division gets this right, the Xbox One is going to be a very, very big piece of bread." As an innovation case study, there seems to be a lot to learn from the whole Xbox story. (And I'm realizing I don't enough of it yet. Suggestions for good reading on the topic?) Microsoft has been trying hard to get into the post-PC space for a long time (Surface, Windows Phone, Zune, etc.) and has had pretty poor results. But then here's this amazing exception with the Xbox platform. They've done some great work, truly connected with their gaming tribe, and have the business results to show for it. What can we take away from this story? Only that it's a game of numbers and that most new products fail? I think there's more there. Certainly a lot of products fail. Or at least most don't turn out nearly as well as hoped. But even in less successful new products, we can learn from both what worked and what didn't. The opportunity is in learning to recognize the wins and being able to pivot to leverage them. It's about being prepared to capitalize on these happy 'accidents' when they turn up. Even when they lead in unexpected directions. Things rarely go exactly as planned, and our ability to adapt well can mean the difference between success and failure. Microsoft is building on the Xbox platform to expand on and support what their users are already doing with the current generation device. The world has changed a lot since the Xbox debuted but it found a profitable niche that has the potential to be the cornerstone for the company's post-PC strategy. They're reaching beyond just games and developing a full entertainment system for the home (hardware, software, services, and connectivity). They're calling it the 'All-in-one entertainment system'. It's a complex puzzle to figure out but I hope to see them pull it off. As we work to ship new products and services, the effects of fear underpin our most common challenges. There are many different fears that can gnaw at us, but the end results are usually the same: we avoid accountability and we stall. Our sense of urgency is eroded until we've buried ourselves in meetings and nothing gets done. Instead, we can make the decision to take responsibility and relentlessly push for forward motion. We acknowledge the fear but we don't let it stop us. We take ownership of our work and refuse to settle for the plodding pace of status quo. Having worked in both very large and very small firms, it's been surprising to see these same challenges derail innovation efforts at both. The smaller places can have it easier to get past those challenges but it still boils down to this matter of deliberate choice. In my world, this has two practical applications: As an individual, I can make this decision to push harder personally. And as a leader, I can encourage the teams I work with to use our many meetings to generate clear actions, ownership, and a sense of urgency. Together we can build the habits and momentum necessary to ship, and ultimately enjoy the rewards of building a culture of innovation. I’m a longtime fan of the Chicago based web-application firm 37signals and have enjoyed their blog, books, and other writing on how they approach business. They’ve been outspoken in their opposition to the typical bureaucracy found in the corporate world and provide a refreshingly different take on how to tackle today’s business challenges. Co-founder Jason Fried’s article for Inc. Magazine last week was an insightful look at where they’ve found themselves coming up short recently. He talks about the inherent tensions between being a detail oriented culture with an obsession with quality and being able to move quickly in the development process. Both skill sets are critical, but like most things I talk about here, it pays to be intentional about which tool you’re using for which purpose. All of us were excited and working hard, but a week later, we had almost nothing to show for our effort. Nearly two months had passed since we had set out to test our idea, and we still had no idea if it would work. In the early stages of testing ideas, it’s all about moving quickly (and cheaply) with a focus on learning. We’ve been talking about this in terms of risk management. Design and innovation is an inherently risky business, there’s simply no way around that. But that doesn’t mean you have to pile all of those risks into one big opportunity to swing for the fences. That tends to make the endeavor into a pass / fail situation with a low success rate. (Which translates into a lot of wasted time and money.) It’s far better to break those risks into small pieces where you can focus on quickly learning more instead of being caught up in that pass / fail mindset. Fried talks about how they found themselves caught up in the wrong things at the front end of developing an idea. They took a step back, re-focused (partly by setting a very tight time constraint on the exercise), and cranked out a crude prototype that was perfect for testing the idea and helping them figure out where to go next. It’s a great reminder that while sweating the details to put out a quality product is important, we can’t let it bog down the entire process when quality isn’t the point in the early stages. Interesting post from Bruce Nussbaum pitching ideas from his latest book ‘Creative Intelligence’. In it, he talks about how very often we get things backwards in the design process. We create something we think is neat and then bestow it as a gift to the masses. Except that they don’t always share our values or priorities which frequently results in dud products. (His example is Microsoft’s Windows 8 and how poorly it’s been received.) The bottom line is that this approach misses out on the opportunity to serve our customers by designing to solve their specific needs. Now admittedly, I haven’t read his book yet (it’s in the long queue of books to read…), but at face value I’m not sure I agree with his assessment. To say this ‘gift model’ doesn’t work is only partly true. Yes, blindly throwing ideas or products over the wall to consumers is a recipe for a lot of disappointing product launches and burned R&D dollars. But I think most would also agree that using focus groups to dictate what you should build next is dangerous at best. It comes down to using the right tool for the right job. You really do want to talk to those end users / customers / etc. It’s just that you have to focus on asking the right types of questions in those interactions. Those conversations are opportunities to connect and better understand the customer’s needs (especially the ones they struggle to articulate or even see). The point where this goes off the rails is when you start asking them to design the solutions. That’s our job. 1 And that, right there, is the opportunity for real innovation. We build empathy and understanding for their needs and then apply our expertise and creativity towards building things that meet those needs in helpful ways. I’m increasingly intrigued by the ‘white spaces’ in the innovation process. The spaces that land between the more recognized (and glamorous) stages everybody likes to talk about. The brainstorming and all the rest are fun and necessary to the design process. But looking back over these past years I’ve been working in this space, I see what comes after the ‘fun’ stages as being far more critical than the raw ideas. We can get excited about the newness of the ideas and the escape from the daily routine when we join in a well done ideation session. And rightfully so I think. These tools are immensely valuable. Particularly in today’s corporate environments that seem devoid of creative thinking most days. But if all we generate is a nicely curated and formatted list of ideas, what have we really done? Are these exercises only about ‘team building’ and ‘fun’, or are they about building real world solutions from those ideas? Obviously, I’m leaning towards the latter. As a design thinking community, we do a disservice to the rest of the business world when we get them excited about new ideas and possibilities only to let them flounder in the steps that follow. Many times I’ve heard organizations tell about how “we tried ‘innovation’ and it just didn’t work…” That’s a major frustration for everyone involved and yet I don’t think it’s entirely true. They might have tried pieces of an innovation process but simply(?) haven’t landed on a larger process that addresses the big picture of execution. Processes like Design Thinking (and the many related variations) can be fantastic tools for connecting to user needs and generating insightful ideas for how to meet those needs. But like most things, it still boils down to execution. So yes, dig deep and find those great ideas, but also care enough about them to sweat the details in the execution phase that follows. In our great rush to innovate and figure out the next “big thing” we can lose sight of one of the core tenants of good design: Elegant simplicity. Particularly on the user interface and customer experience front, we (the design team) get too close to the product / service and have a hard time seeing it objectively. What makes sense to us (after spending so much time with the design), doesn’t necessarily make any sense at all to the people we’re trying to serve. It takes deliberate intention and hard work to get beyond the initial complexity to create intuitive and usable designs. Our continuing challenge is to push on towards the elegant simplicity on the far side of complexity so we can build truly useful and usable things. Interesting read over at Asymco this morning that really continues to pique my interest on the business differences between companies like Google, Samsung, and Apple. It gets down to the fundamental questions of defining what business you’re actually in. For this specific discussion, it gets into deciding if raw volume / market penetration is really the game to be in. Looking at Horace’s analysis comparing Google and Samsung (mobile only), the Android platform starts looking like an interesting case study in profitability. Who’s making money on Android? In reality, Google doesn't actually make that much on it, while the phone manufacturers (notably Samsung) are putting out impressive revenue numbers. Despite the fact that Google’s Android OS has huge (and growing) market share, the finances behind it are different than you might expect. It turns out that the real money is on the hardware side of the equation these days. Samsung is making a lot more operating profit from Android phones than Google makes from all of its businesses combined. And Apple is even farther down that path with their profit numbers based on owning the whole iOS package. And now we see Google trying to make a move into the high end laptop market selling their own Chromebook (versus partnering with other PC makers as in the past). It’s a high end machine, purpose built around tight integration with Google's cloud services. They clearly see some opportunities to make more money and it will be interesting to see how they do with it. From an innovation perspective, it comes back to that question of defining the business you’re in. Sometimes the best move for providing better products / services for your customer can be to make a lateral move into an adjacent space to provide a solution from a different angle. And ironically, that move can also shift the profitability in your favor as well. Getting the vision clear on who exactly you’re serving and what problem you’re solving gives you a tremendous platform to work from. It helps give the clarity needed for building out great solutions … for both you and your customer. Google just released an update on their much anticipated Glass project showing more of their "vision" of the future. Regardless though, this stuff completely and utterly amazes me. These glasses seem straight out of the many sci-fi movies and novels I've enjoyed over the years. It’s easy to get dulled and blind to the astoundingly powerful devices at our fingertips but I think it’s important to keep some of our sense of wonder at all this. Apparently, the future is sort of choppy, a little nauseating, has an upbeat soundtrack, and is full of extra data and privacy concerns. But it sure is cool. Sounds about right. So bravo Google, for pushing ahead and doing something remarkable. Now please don’t be creepy with all this new information you’re going to be collecting and processing. If you’d like to be part of this new (and very unevenly distributed) future, hustle over to Google’s Glass site and get in line. They’re taking applications to see who gets the privilege of shelling out $1500 to be part of the initial launch. And by the way, you’ll also have to get yourself to San Francisco New York, or Los Angeles to pick them up on launch day. Something like “shipping not included”. Fun video from Volvo Trucks about the importance and place of design. We’re building (and selling) integrated solutions, not a pile of parts. Good design is where those parts come together to create a cohesive whole that serves both the needs of the customer as well as those of the teams / processes required to produce that solution. Design is the glue that holds the whole process together and helps solve the many integrated problems underlying an innovative solution for an unmet customer need. I’ve been doing a lot of thinking about the design and development processes lately. One of the key challenges for me has been figuring out how to integrate the creative front end processes (like Design Thinking) with the rest of the development process for technical execution. In the years I’ve been working on the creative end of the process, the biggest challenge consistently seems to be with translating cool new ideas effectively into real world solutions. Relatively speaking, it’s easy enough to generate new and novel ideas on the front end. Getting those ideas safely and effectively through the rest of process is a whole different thing. One part without the other simply doesn’t work. Either you get a novel idea disconnected from the real world or you have a well executed product without any real innovation or connection to the customer. The phrase “continuous iterative improvement” was what jogged my brain this time around. What if the creative Design Thinking type processes could be tightly integrated with something like the Continuous Improvement methodology? Best practices for empathizing with customers and innovating around their needs paired with focused and effective execution to make those ideas into reality. Today’s post is really just a teaser into starting down this path. There’s a lot more thinking and development needed to get this worked out. But I wanted to get this out there and get your input on all of it. What’s your take on pairing up fuzzy front end creativity with excellent technical execution on the back end? Please leave a comment here or shoot me an email with your thoughts. Behind the Scenes: And yes, it’s been way too long since I last posted. Sorry about that. New job and lots of things shuffling around in life. Having said that, I’m settling into a new (and hopefully more stable…) routine and posting here is a top priority. So stick around and we’ll see where this thing goes. I don’t know how else to make a movie except to try and find some aspect of the experience that I haven’t done before. Because if I’ve done it before, I’m fearless. And I don’t work well when I’m fearless. I’m not as good a filmmaker if I know exactly what I’m doing every step of the way. But when I don’t have all of my comforts with me, then I get really really insecure, and that insecurity opens me up to possibilities. I need to get to set in the morning feeling a little upset to my stomach. If I feel a little bit unsettled, I feel more able to take risks to rescue myself. I don't know about intentionally pushing for an upset stomach every morning, but unsettled enough to be out of the comfort zone definitely hits the mark. By definition it's not comfortable, but it opens the door to push the boundaries and find the new possibilities we're looking for. It's a good reminder to get out there and push past the comfort zone today. Over the past year, I’ve become increasingly aware of the power of gratitude and it’s something I’m working to incorporate more intentionally into my life. So here’s a couple things relevant to the area of innovation that I’m grateful for. While there are challenges with living and working in the turbulence and constant change we’ve found as the new “normal” in today’s business world, I am profoundly grateful to be a part of it. I think we live in the most amazing time of history. The technology, tools, and connectedness that has come along with those tools have made the impossible possible in so many ways. One of my favorite pieces of the innovation puzzle is connecting seemingly disparate ideas and technologies to make something new and useful. For me, that’s the core of the whole thing and it’s what keeps me digging around in this space looking for new connections. On a related note, here’s a paraphrased quote from Rodney Mullen (you’ll remember his if you were into skateboarding in the early 80’s like I was…) at a TEDx talk speaking on creativity and innovation. And lastly, I’m thankful for readers like you that follow along here. Have a great Thanksgiving holiday! Collaboration: Important Enough to Hire and Fire Over? Interesting news bit yesterday from Apple with some executive level leadership changes. Scott Forstall, Senior VP for iOS Software, has been shown the door and his responsibilities have been redistributed to other execs. John Gruber does a solid job summarizing the situation over at Daring Fireball. Apple’s press release frames it as “changes to increase collaboration”. An interesting way to put it. Particularly in light of Forstall’s long track record with the company. His work with Steve Jobs dates back to NeXT in the early 90’s and he has been in charge of developing iOS from the very beginning. iOS has come a long way since its debut in 2007. It’s dramatically impacted the mobile phone industry and also shifted Apple’s business tremendously along the way. The bottom line is that under Forstall’s leadership, Apple released an amazing product and amassed an amazing amount of cash because of it. So why was Forstall pushed out? Of course the details are thin, but the signs point strongly to his ability (and lack thereof) to work with others on the executive team. He had become an increasingly polarizing and abrasive figure within the company. To the point that he and Jony Ive (Senior VP of Design) wouldn’t even sit in the same room for meetings. In short, he had become an obstacle to collaboration. After reading Steve Jobs’ biography, and hearing about how hard he was to work with and the ways he could be downright mean to coworkers, I’ve wondered how the “new” Apple will choose to define itself. And now we get a glimpse of where they’re trying to go. Even at Apple, collaboration is treated as a cornerstone to innovation. To the point that even stellar performance doesn’t trump an inability / unwillingness to work collaboratively with the team. Today’s question then is how seriously are you taking collaboration in your organization? Is it worth hiring and firing over? Or are you tolerating certain people who have set themselves up as roadblocks? That attitude doesn’t go unnoticed throughout the rest of the company and it directly impacts its ability to work together towards innovation. Take a moment today to look for ways you can encourage collaboration among your teams. The results will be well worth the effort. If you’re serious about innovating, it can't just be something tacked on to key projects. It’s a mindset that needs to become a central part of the organization's culture. Every project is an opportunity to innovate. And to be successful, every one of those projects needs an element of innovation. Each of them is an opportunity to make a product or service that better serves the needs of your customer. But keep in mind that innovations don’t have to be “big” things. Small things done with the right focus can have gigantic impact. Get in the habit of cranking out small innovations at every opportunity and you’ll be amazed at their combined impact. Let's get practical: On the project you’re working on right now, how are you innovating? How are you meeting that customer need in new and better ways? If you’re not creating at least some small innovation with this project, pause to take a hard look at it. If the project is worth the time and resources being put into it, it’s worth making the effort to ship something innovative. Let’s make the most of these opportunities and use every chance we get to make innovation a reality.